I have sat back severally to really consider the workability and the effectiveness of various strategies being adopted in the realisation of the Biafra restoration efforts. 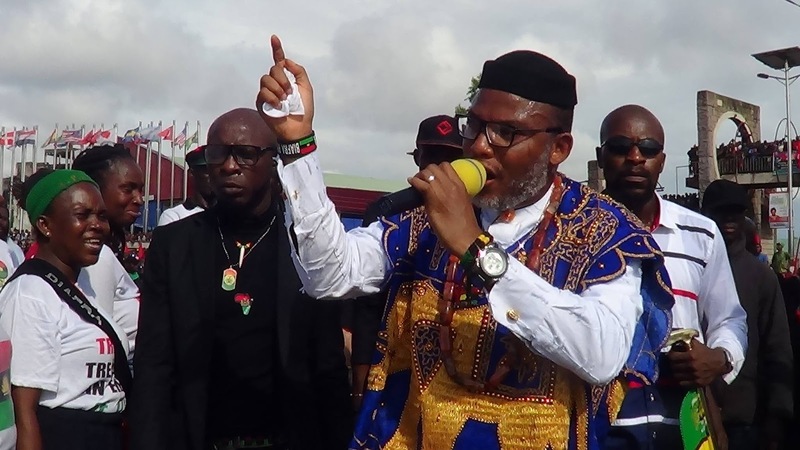 Looking back at where we were years ago, where we presently are and the road map carefully crafted by the highly enlightened and rugged leadership of the Indigenous People of Biafra (IPOB) worldwide ably led by our supreme commander, Mazi Nnamdi Kanu, for the future, one could not but only realise the fact that very appreciable records have been made despite the many daunting obstacles encountered on the way. This struggle has been and is yet being carried out in phases according to plans. Firstly, it was premised on non-violent, peaceful street protests geared towards massive resistance against oppressive and highly despotic policies of the Nigerian government steadily being meted out against Biafrans especially from 2015 when there were concentrated massive protests demanding the unconditional release from incarceration, of the leader of the Indigenous People of Biafra (IPOB), Mazi Nnamdi Kanu and the accompanying relentless gross abuses of his fundamental human rights. These series of civilised dissents, invariably provoked and inaugurated consistent civil uprisings ever known to any government in Nigerian history. Young Biafran men, women, youths and of course the moderately aged of all life endeavors in their intimidating numbers in cities and towns across Biafraland, courageously, armlessly and most uniquely, braced up to the challenges propped up by the killing spree of the combined teams of the Nigerian security operatives that encountered our people in droves. Biafrans in pursuance in what they believe in, which is freedom, justice and restoration, fully embedded in tactical discipline of non-violence, defied the guns and live bullets, armoured tanks, jackboots, deaths and gross human rights violations. All these were yet incomprehensible to the unlightened as those cruel events lasted. Biafrans have remained exceptionally resolute and in- undaunted ever, while the oppressors and the vampires keep getting bewildered and confused in their evil schemes. The events of those days have really fired our spirits up to keep focus. There has unarguably over time, arisen millions of Biafrans who, morally connected beyond the prevailing prejudices from the Nigerian establishment, are very defiantly opposed to the evil antecedents prevalent in the society against the overriding interests of the indigenous Biafran people. The saboteurs of Biafra extraction who are daily working with their Northern Hausa-Fulani slave masters to subvert our restoration efforts have only momentarily succeeded in their desperate bids to keep serving their crass selfish agenda. Secondly, the wisely adopted strategy of boycott of all Nigerian - organized or sponsored elections in Biafraland starting mainly with the Anambra state gubernatorial election scheduled for this Saturday being the 18th day of November 2017, must be commended. Election boycott is a fundamental right of citizens employed as a tool of civil disobedience against government policies and programs to press home a justifiable demand. It is a legitimate approach world over in a democracy, to register public displeasure. I may have been aversed to this strategy if there were other possible antics that will not count on government's goodwill but that which exerts an insurmountable pressure and compel unwilling authorities to promptly yield to the mandate of justice. We must however, very strongly and uncompromisingly demand for the unfettered freedom of the Biafran people and the total restoration of the sovereignty of our nation-Biafra, through the instrumentality of election boycott. We must maintain positive, unique, and a more determined resolve to employ and sustain the potency of elections boycott within the Biafran territories. Our determination to reshape our destiny as a people must not mutate or be stifled with. Massive boycott of elections remain a very civilised, highly enlightened, matured, veritable and non-violent approach that brings down to it's knees, any despotic and stubborn government, to compliance with popular and just demands of a willing people. It is a legitimate way of stimulating massive civil disobedience towards realising set objectives democratically, and whose results are uncontestable. Election boycott is world proven and legally backed non-confrontational method of disengagement. Therefore, here in Biafraland and especially in Anambra state, Biafrans are mandated to as a way of democratically expressing their popular will, remain in their homes this weekend precisely on Saturday 18th November 2017, from 6am to 6pm. Do not go out to cast your ballots (votes) in support of any politician and by the time we are done with this exercise, the Nigerian government and of course the entire civilised world, will better understand our resolve as Biafrans since these years of our restoration efforts. Let us keep focus and in unison, play the men for our God!